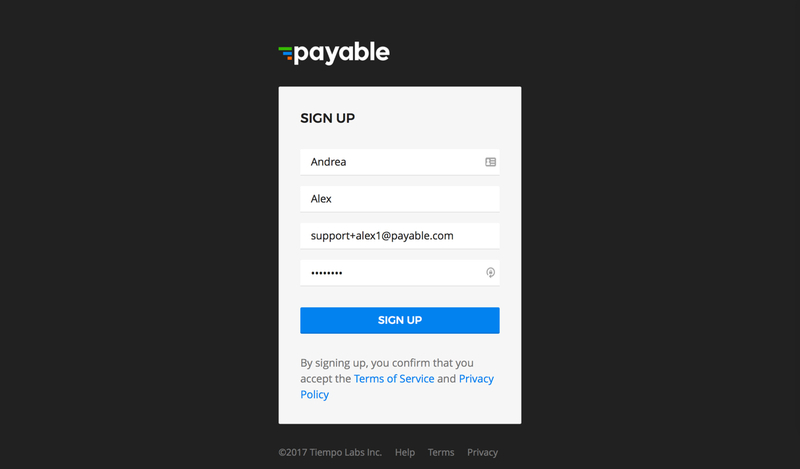 My Company Invited Me to Payable - What Happens Next? 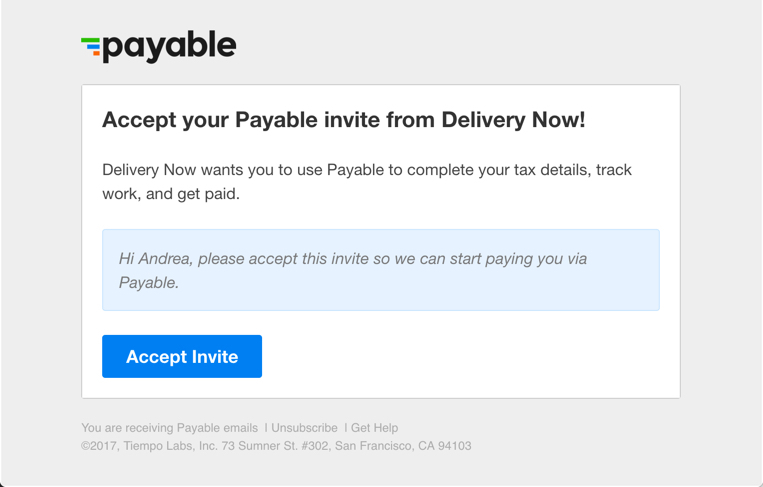 Your invitation comes from the company you’ll be working for, in this example, “Delivery Now.” All you need to do is tap “Accept Invite” and Payable will take you through the onboarding flow. Make sure to have your bank account information handy! Enter your first and last name, and create a password. Then tap "Sign Up" to continue the onboarding flow. 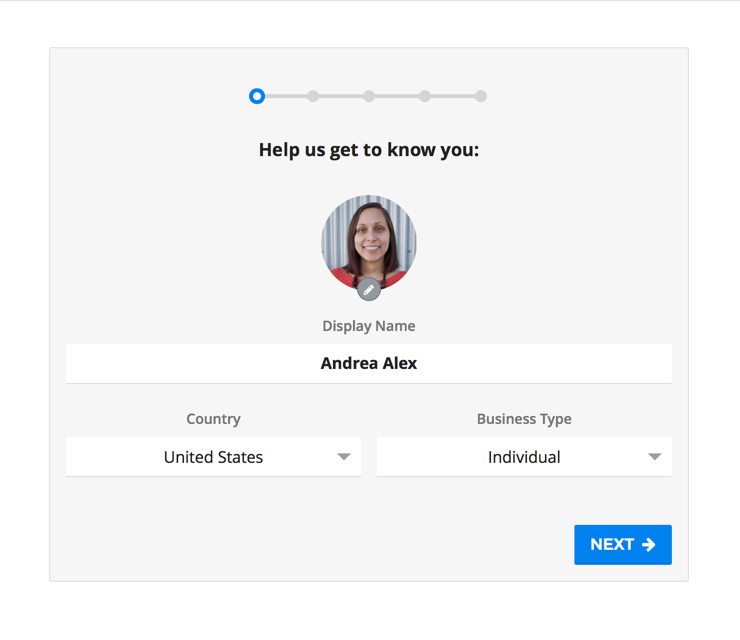 You can choose the most relevant name for you as your Display Name (can vary from legal name), and then make sure to add your Country, and Business Type. The Business Type determines what details are asked for next - generally, “Individual” is most common for an independent contractor, but all Business Types are accommodated. These are the options you can choose from: Individual, Sole Proprietorship, LLC - Single Member, LLC - C Corp Tax Class, LLC - S Corp Tax Class, LLC - Partnership Tax Class, C Corporation, S Corporation, Partnership, Non-Profit. Then tap "Next" to continue the onboarding flow. 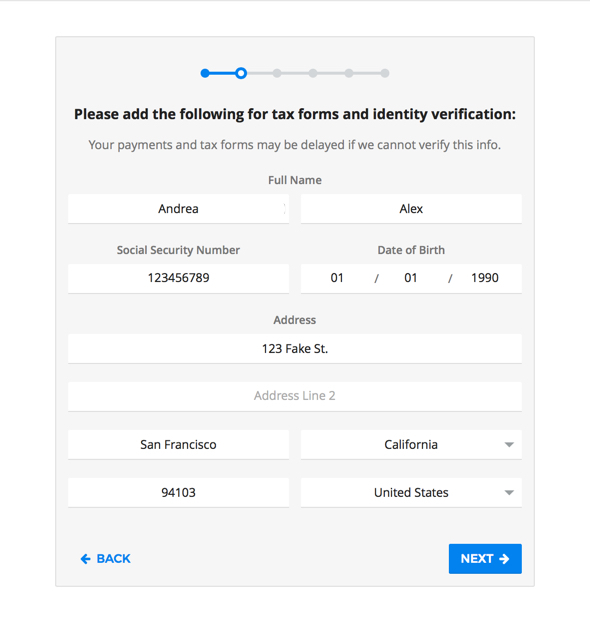 Payable asks for Full Legal Name, Social Security Number or Employer Identification Number, Date of Birth, and Business or Home Address to generate your W-9 (step 5) so Payable can send your 1099 tax forms at the end of the year. Then tap "Next" to continue the onboarding flow. 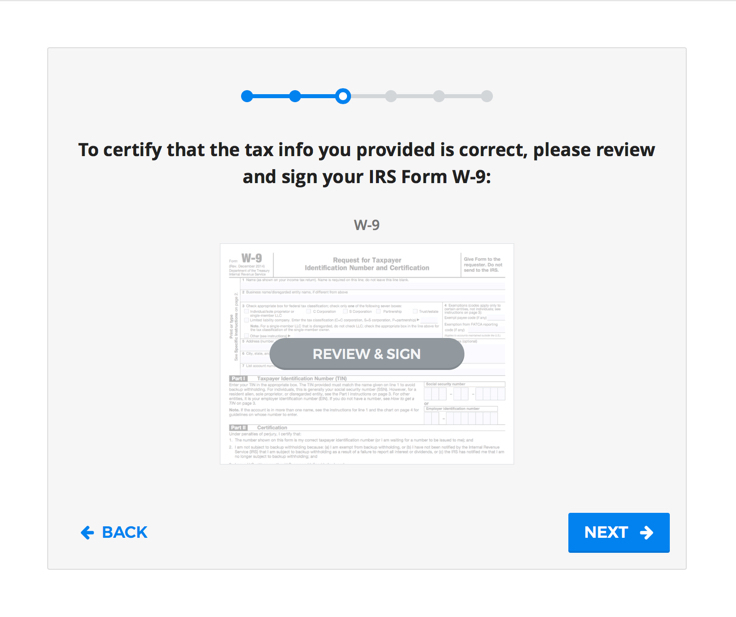 Your W-9 can be signed on any device (desktop, mobile, tablet, etc.) and is completed in just a couple taps. Start by tapping on "Review & Sign." Once Signed tap "Next" to continue the onboarding flow. 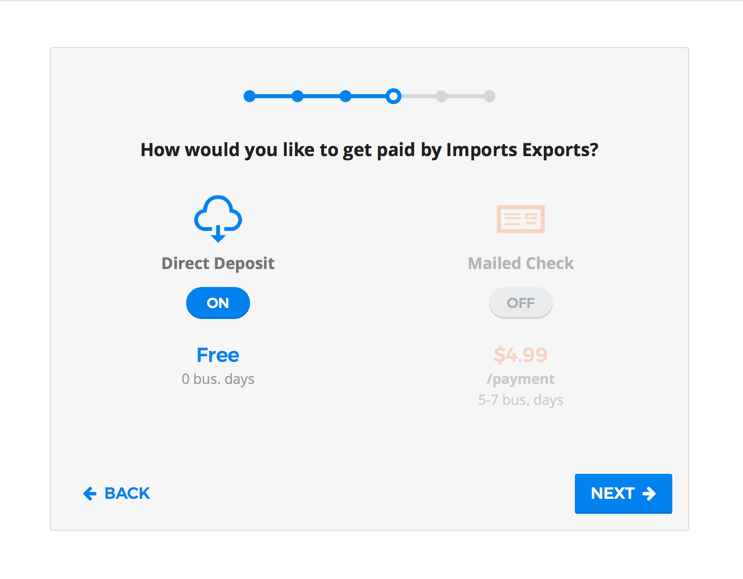 If your company has enabled multiple payment methods, you'll be able to choose which payment method you would like to use for getting paid. If you don't see this step, no worries! That just means your company has not enabled multiple payment methods. Tap "Next" to continue the onboarding flow. 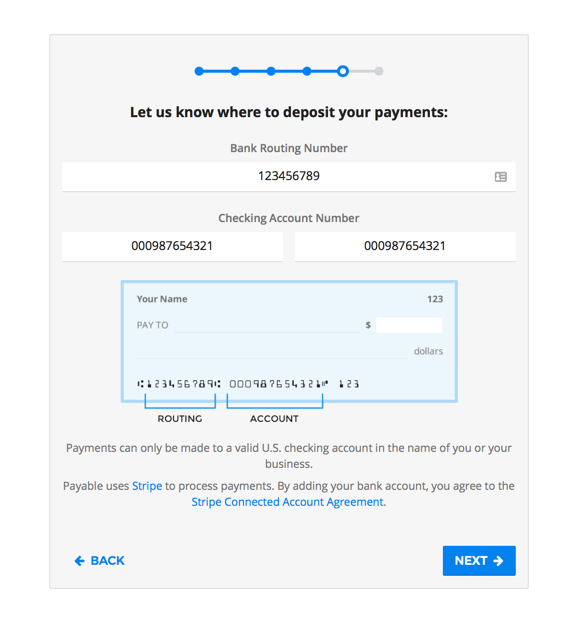 Add your checking bank account number and routing number so Payable knows where to send your money! As soon as your bank account information is input, Payable immediately verifies your account with a small deposit ($0.01). If you enter your bank information incorrectly, don’t worry! Payable will automatically notify you of this, and any other errors as soon as possible. Your payments will be held until Payable has verified your account, and you’ll receive your payment the next business day. Tap "Next" to continue the onboarding flow. 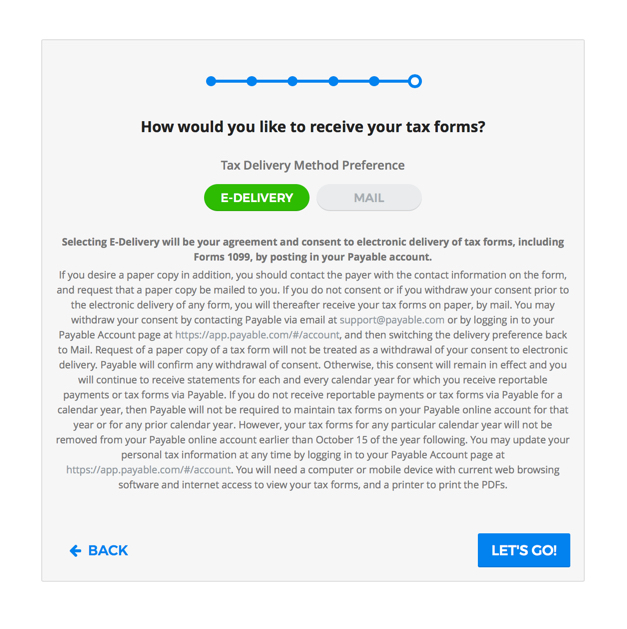 In this final step, you can choose whether you want your 1099 tax form e-delivered via email and available as a printable PDF within Payable OR have it delivered via postal mail. Companies are required by the IRS to obtain your consent in order to use e-delivery - otherwise, physical mail is the default method. A digital copy of your 1099 will also be available in Payable to access any time. You can update or change your information at anytime. Learn more here - How Do I Update My Account Information?